We're all for sensible preservation in New York, though of course what constitutes sensible is the perennial rub. 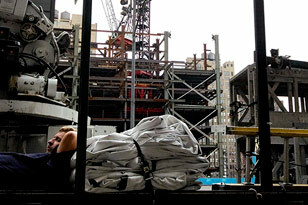 Nostalgia for a bygone New York, however, is anathema to this city's essential core — we are forever a work in progress. As the change is incremental — resident by resident, building by building, business by business — the view isn't usually altered all at once. At just this moment, though, it seems we've got an extra helping of change. Eloise doesn't live here any more. The Plaza, having passed through a number of hands in recent years, will someday reopen, but fundamentally altered. The Fulton Fish Market, after 184 years, is now a resident of the Bronx and its name may have all the resonance for future New Yorkers as Washington Market, once such a vital part of the Tribeca area, does for us. Last month, the Times and other publications noted the retirement of Mary Blevins, the popular waitress and institutional memory of Junior's in Brooklyn. The Chelsea flea market has decamped to Hell's Kitchen, while the flower district has also been hit with a case of wanderlust (though right now they remain firmly planted in Chelsea). Broadway theaters still summon up the past in the theater district, but there was something about HoJo's, its Simple Simon logo, its desultory air and its fried clams, that provided a more visceral connection to the past. (There are now only five Howard Johnson's restaurants left in the country). And with the terribly sad death of Peter Jennings, the three media fixtures — Jennings, Brokaw, and Rather — have all left the building. Yes, the city's recent history has added an undercurrent to the urban tides. But those tides are as old as the city itself. So we pause to note them, and tip our hat.